PVMBG noted that due to decreased volcanic seismicity and activity the Alert Level for Ambang was lowered to 1 (on a scale of 1-4) on 8 August. Residents and visitors were advised to not approach the crater. This Bulletin report, our first one on Ambang (figure 1), covers activity from 1966 to August 2014. Activity was sporadic, with decades of neither eruptions nor significant seismicity. Data for this report was gathered primarily from the Pusat Vulkanologi dan Mitigasi Bencana Geologi (PVMBG; here referenced as CVGHM which stands for Center for Volcanology and Geological Hazard Mitigation) and the Darwin Volcanic Ash Advisory Centre (VAAC). Figure 1. Ambang's location seen on two maps. (A) Ambang (tip of the red pin) is located in North Sulawesi, Indonesia. (B) Ambang lies S of Mount Pinupulan and Molibut. The nearest city, Kotamobagu, is to the W of Ambang, and Lake Danau is to the E. PVMBG reports call attention to several villages that sit to the S of Ambang. Graphic made by Bulletin editors from a base-map image by Google Earth. 1966 to 2013. In 1966, earthquakes were felt as far away as Purworejo (figure 1). These were followed closely by the release of sulfurous gases through two new vents near Kali Putih E and on the N slopes of Ambang's crater. On 22 December 2005, Ambang erupted phreatically, forming a fumarolic field that was still in existence during 2014. According to CVGHM (2014), resulting pyroclastic flows from potential magmatic eruptions were most likely at that time to affect villages to the SE, including settlements such as Bongkudai, Goaan, Purworejo, and Modayong. Ambang's seismic activity for this reporting interval was generally mild and the hazard status mostly remained low (Level I). In 2010, seismicity substantially increased with a maximum of 33 earthquakes (during unstated interval) and the Alert Level was raised to II (on a scale of I-IV). In June 2013, there were two active fumaroles on the SW side of Ambang, based on an expedition by John Seach that was reported on VolcanoLive. 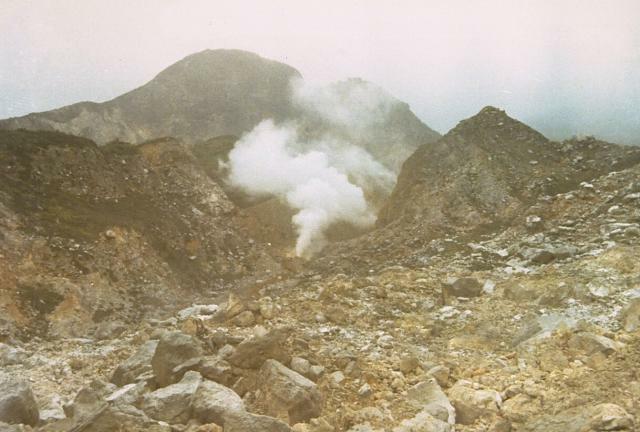 The westernmost fumarole emitted a thin white plume to ~100 m above the vent and the easternmost fumarole occasionally emitted short white vapor (figure 2). Furthermore, the team noted that the summit was "heavily forested" and there was "a strong smell of sulfur." Figure 2. A fumarole on Ambang released a plume to several meters high. More pictures of Seach's visit are listed on the VolcanoLive website. Photograph by John Seach. Courtesy of VolcanoLive. Activity during 2014. From June to August 2014, Ambang had a short-lived substantial increase in volcanic seismicity and a more constant tectonic seismicity (table 1). On 3 July 2014, CVGHM raised the alert level from Normal (I) to Alert (II), and the region within 1.5 km of the crater was cordoned off. Thin, gas emissions were observed rising throughout June, July, and August from the crater to a height of 10-25 m. By 8 August, the volcanic seismicity decreased and CVGHM lowered the alert level from II to I. The Aviation Color Code also changed from Yellow to Green, based on a Darwin VAAC report. However, residents were still cautioned not to approach the crater. Table 1. Number of earthquakes between June and August 2014 as recorded by analog and digital CVGHM seismographs at Ambang. (Exact location of seismographs unspecified.) Volcanic (Volc.) earthquakes are categorized based on their depths as shallow or deep; and the tectonic (tect.) earthquakes, based on their distances from Ambang as local or distant. Note that CVGHM did not quantify "shallow," "deep," "local," and "distant." The time intervals are of irregular length. Data courtesy of CVGHM. CVGHM background. The Ambang stratovolcano consists of a row of relatively-young cones from the Quaternary period, which extend N and S. It lies in an area cut by normal faults. Ambang's generally has had repose intervals of 39 to 127 years between eruptions. CVGHM also noted that previous eruptions were often dominated by lava flows, pyroclastic flows, and ashfall. As seen on figure 3, the regions affected by eruptions at Ambang have been qualified by Hadisantono and others (2007) into hazard zones I (yellow), II (light pink), and III (darker pink). Each of these areas is defined by both a radial area with circles, as well as specific irregularly shaped zones corresponding to topography or local conditions. The key is in both Indonesian and English (legible on the pdf version). According to CVGHM (2014), the population densities for hazard zones I and II have increased dramatically in the past decades. They noted 17,240 people in hazard zone II alone as of 2014. Figure 3. Hazard zone map showing three primary zones shaded with yellow (I), pink (II), and dark pink (III). The circles centered on the volcano have radii of 1.5 km, 5 km, and for the yellow circle, 8 km. Courtesy of Hadisantono and others (2007) and found in CVGHM (2014). Geochemistry tables for Ambang appear in CVGHM (2014) and in Jaffe and others (2004). Information Contacts: Center for Volcanology and Geological Hazard Mitigation (CVGHM, Pusat Vulkanologi dan Mitigasi Bencana Geologi), Badan Geologi, Kementerian Energi dan Sumber Daya Mineral (ESDM), Yogyakarta 55166, Indonesia (URL: http://www.vsi.esdm.go.id/); Darwin Volcanic Ash Advisory Centre (VAAC) (URL: http://www.bom.gov.au/info/vaac/). On 3 July, CVGHM reported a significant increase in seismicity from Ambang, particularly shallow earthquakes (VB). During 1 June-2 July, 7-9 shallow volcanic (VB) and 2-9 deep volcanic (VA) earthquakes were detected per week, for totals of 33 VB and 29 VA earthquakes in that time. The Alert Level was raised to Level 2 on 3 July. An exclusion zone was placed around the crater with a radius of 1.5 km. Persistent diffuse gas emissions were observed reaching 10-25 m above the crater. CVGHM noted that previous eruptions were dominated by effusive lava flows and were punctuated by explosive eruptions producing pyroclastic flows and fallout. The last event recorded at Ambang was a phreatic explosion in 2005; a persistent fumarolic field remains from that activity. CVGHM noted that a magmatic eruption generating pyroclastic flows would threaten communities SE of the summit including the villages of Bongkudai, Goaan, Purworejo, and Modayong. The compound Ambang volcano is the westernmost of the active volcanoes on the northern arm of Sulawesi. The stratovolcano rises 750 m above lake Danau. Several craters up to 400 m in diameter and five solfatara fields are located at the summit. There is no Deformation History data available for Ambang. There is no Emissions History data available for Ambang. 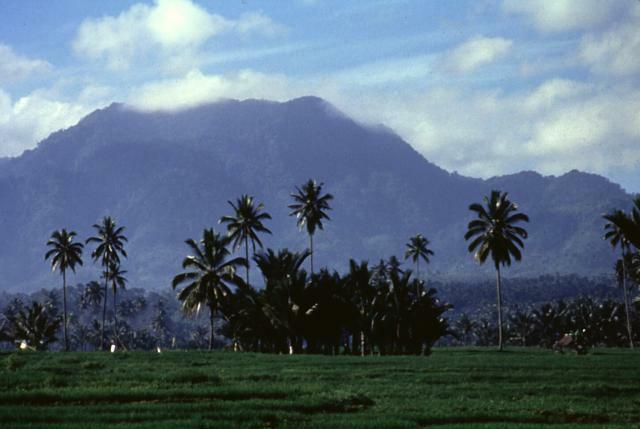 The compound volcano Ambang, seen here from Purworejo village, is the westernmost of the active volcanoes on the northern arm of Sulawesi Island. Five fumarole fields are located near the summit. An eruption in the 1840's is the only one known from Ambang volcano. 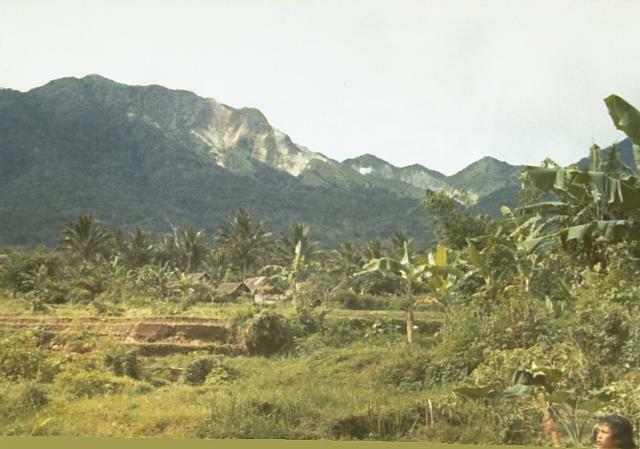 Photo by Ruska Hadian, 1973 (Volcanological Survey of Indonesia). This fumarole, located on the SE side of the summit, is the largest in the five solfatara fields at the summit of Ambang volcano. Ambang volcano, towering above farmlands below its western flank, is a large stratovolcano at the western end of a volcanic chain stretching across the northern arm of the island of Sulawesi. The only recorded historical eruption took place during the 1840's. Five solfatara fields occur at the summit of Gunung Ambang. There are no samples for Ambang in the Smithsonian's NMNH Department of Mineral Sciences Rock and Ore collection. IRIS seismic stations/networks Incorporated Research Institutions for Seismology (IRIS) Data Services map showing the location of seismic stations from all available networks (permanent or temporary) within a radius of 0.18° (about 20 km at mid-latitudes) from the given location of Ambang. Users can customize a variety of filters and options in the left panel. Note that if there are no stations are known the map will default to show the entire world with a "No data matched request" error notice. Large Eruptions of Ambang Information about large Quaternary eruptions (VEI >= 4) is cataloged in the Large Magnitude Explosive Volcanic Eruptions (LaMEVE) database of the Volcano Global Risk Identification and Analysis Project (VOGRIPA).